Our mid-season update, Season 8.5, is now live on Holodeck! Read on to learn about the updates you will experience in this update. Also, you can check out the full Release Notes here. Season 8.5 is now available! In this update, players can fly to a hidden station at the center of the Solanae Dyson Sphere and join Tuvok from Star Trek: Voyager on a mission to stop the sphere's most dangerous technology. In addition, early Fed missions have been revamped with art and gameplay improvements, a new shuttle PVP map has been added and a weekend event calendar replaces the hourly events. There are also new systems for quickly swapping ships and equipment that will help players get into the game faster. For information about all of Season 8.5's features, check out this Dev Blog index. To celebrate Star Trek Online's 4th anniversary, from now until February 27, 2014 players will be able enjoy special missions and rewards. Collect Qmendations for a free Dyson Science Destroyer Starship, and play the Featured Episode "A Step Between Stars," starring Tim Russ as Admiral Tuvok. Report to Subcommander Kaol to play "A Step Between Stars," or Q in Earth Spacedock, Qo'nos or New Romulus for the daily mission "Party Patrol." You will need 1,000 Qmendations for the Dyson Science Destroyer; collect 400 on your first playthrough of "A Step Between Stars." After February 27, 2014, the Featured Episode will be available for maximum-rank characters. Early Starfleet missions have been updated with new art and gameplay improvements. We've improved the flow, made story updates, and overall improved the play experience of these missions. 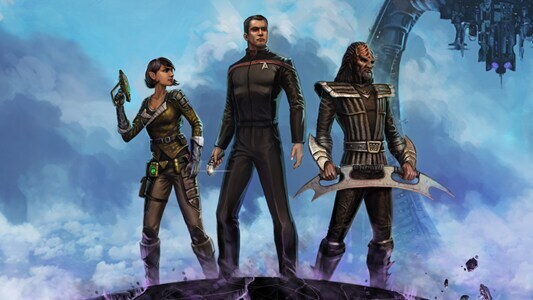 This is a great time to start a new Starfleet character and see what's changed! A new small craft PvP arena has been added to the PvP Queues. Pull your favorite shuttle or runabout out of the docking bay and try your skills against other players! The Hourly Events Calendar is being replaced with a series of longer events that will run for several days centering around a weekend with much larger rewards for participation. Some of the more popular hourly events, such as Tour the Galaxy, have been converted into daily missions. Switch to another starship in your personal fleet from any social area or sector space! To access this new feature, click the "Switch Starships" button on your ship's page in the Status Window. You may switch ships once per minute. Quick Equip allows you to quickly swap out gear for your Captain, Ship or Bridge Officer. Click on any item slot in the Status Window, and the Equip window will show you all available items that can be used in that slot. If you are in a map with Bank access, you will be able to access items from your bank. Otherwise, they will be gray, but you will still be able to see all of your current options. (Going live soon) Load-outs allow you to set up pre-set builds for each of your ships (two slots are provided for free on each ship, and additional load-out slots may be purchased in the C-Store). When you swap to a different ship, it will remember the load-out you left it in, and you can swap to a different saved load-out if you choose.